Back on June 4, 2012 we had wind gusts in Jackson Hole of 51 and 59 mph recorded at the Airport and in town, respectively, at around 4:30 p.m. These gusts were due to a few dry thunderstorm cells that moved up from northern Utah and southwestern Wyoming, traveling from south to north, over Snow King Mountain and up through the Jackson Hole Valley and on towards Yellowstone, before dying out in the evening. (See Lightning Strike Map below). These gusts were very brief, and were strong enough to topple some large trees around town. Strong downdraft winds from dry thunderstorms that exceed 50 mph are known as “microbursts”, which these were. 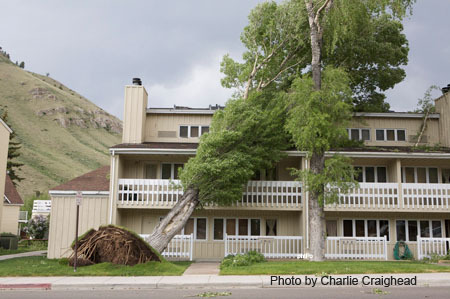 Microburst winds originate from the base of the thunderstorm and come straight down, impacting the ground, and then spread out in all directions. (See photo below, courtesy of Charlie Craighead). On Sunday, June 17, 2012 we had gusty winds that began around 10:00 a.m. and remained strong throughout the day and into the nighttime hours, topping out with peak gusts at around 5:00 p.m. These winds were the result of a strong jet stream that stretched across the eastern Pacific and into the Northwestern U.S. on Sunday. At 30,000-ft. this jet stream was running at over 100 mph over Washington State & Montana. (See jet stream map from Sunday afternoon below). Down here at ground level in western Wyoming & eastern Idaho, we experienced wind gusts in the Town of Jackson of 34 mph. 40 mph at the Jackson Hole Airport, and a 53 mph gust in Grand Teton National Park, just east of Jenny Lake. At the Driggs Airport they recorded a gust of 51 mph. These winds were more of a straight-line wind, consistent in direction, from the West-Southwest, primarily. One thing that makes the jet stream so strong is a big difference in temperature from north to south, at all levels in the atmosphere. For example, at the surface high temps over southern Canada and the Pacific Northwest on Sunday were only in the 60’s, whereas high temps over California, Utah, and Colorado were in the 90’s, to low 100’s in the Desert Southwest. Look for that cooler air from the north to arrive on Tuesday!